The Vaccines turn it up to eleven on their new album. It’s a riff-heavy extravaganza that shows the band pushing ambitiously for a bigger sound, with mixed success. English Graffiti is like a hyper-Vaccines record. Pumped up guitar riffs, whirring distortion and groans, sirens, and a great big dollop of genres and styles forced somewhat jarringly into line with each other. It’s big, heavy, and lumbering – there’s a lot to digest, and not all of it smoothly. “Dream Lover” is a menacing, mechanical track that’s lifted out of its otherwise dirty pressing sounds by melodic alien-esque synths. 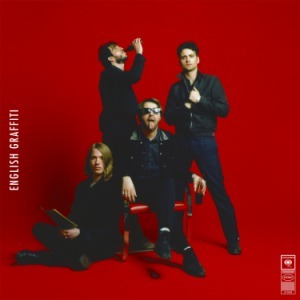 It’s like The Vaccines” version of a sci-fi slasher flick, but it works. Following track “Minimal Affection” tacks on the problem of modern social media disassociation (“in a world of minimal affection… you forget how to make a connection”) in an electro-pop-y track with backing synths that sound like something of a game-boy theme tune. “20/20” is a bit more original Vaccines – high-octane all-out guitar rock – the same could be said for “Radio online casino Bikini,” although it’s not as good of a track. Here the noise sounds forced, rather than the result of a natural outpouring of energy. “Want You So Bad” is a kind of drawled dirty funk; “Gimme A Sign” boasts a bombastic surprise in the form of its (slightly cheesy) shout-out-loud chorus; and closing track ‘Undercover” is a instrumental winding down of an altogether confusing and chaotic record. Then there’s “(All Afternoon) In Love,” a drifty gossamer piano ballad that randomly inserts itself into the middle of an album it doesn’t really fit with. The genre-conglomerate of English Graffiti doesn’t have to be a bad thing… but this song doesn’t sit right here. It’s too much like something of a stage musical… too sincere for where it is. After all, there’s a kind of kitsch/tongue-in-cheek thing going on in the genre-rolling, larger-than-life attitude of the album. It’s both a glorification and satire of modern life, music, and pop culture.